There are girls who like coffee, and then there are those who ~love~ it with the entirety of their being. If you’re someone who thinks caffeine should be up there on the list of life’s necessities, then you definitely need to add these eight must-try cafes in Q.C. to your coffee bucket list. This modern, Pinoy-themed cafe sends you on a trip down memory lane with its wooden and Capiz fixtures and historical accents inspired by a group of brave Filipinos; they even have a symbolic red KKK banner on one of their walls. This is the place to go if you love a homegrown cup of joe. Order their bestsellers: Kapeng Ginto, which is a mix of Kapeng Barako and cream made with muscovado sugar and honey. This hidden sanctuary in Industrial Mall is a quirky laundromat place (yes, you can drop your laundry here!) that offers good coffee on the side. The first branch in the country with a cafe concept, the brightly lit place also doubles as a good hangout spot with its vintage decor and industrial interiors. Go and take a sip of their Ghirardelli Iced Hot Chocolate or try their buttermilk latte if you want something lighter. Even with its hip and moody lighting, it’s difficult to miss this place if you’re cruising down Tomas Morato. Other than its premium coffee-based drinks, you can also order snacks, dinner, and desserts at this quaint, brick-walled space. If you’re feeling more creative about your coffee, try its Affogato, a grownup version of a soda float made with vanilla gelato immersed in an espresso shot. afters also offers a wide range of gelato favors—from cotton candy to dark chocomint—that you can also request to taste test first! What goes better with coffee other than cream? A good book! Tweedle Book Cafe is a house turned coffee place that lets you borrow books while you’re enjoying your cup. Try its Genmaicha Latte if you want a different kind of caffeine fix for the day, or be a little more adventurous by ordering hot chocolate infused with Hibiscus. Don’t forget to take a snap beside its Harry Potter-inspired wall, which leads to the cafe’s basement where you can order liquor and wine. Location: 106-B Scout Gandia St.
Maillard Specialty Coffee (pronounced My-yar) first started as a small booth at a food bazaar before it officially opened as a third wave coffee place in Corinthian Gardens. A favorite hangout spot for the homeowners of the subdivision, this coffee hub boasts premium coffee beans and advanced equipment. We love the simplicity of its espresso, which comes with a Lotus Biscoff cookie on the side. Looking for a dose of inspiration? Cafe Mithi’s three-story building is filled with encouraging messages and quotes plastered as calligraphy and photography on its walls. This cafe is creatively Filipino with its coffee selections—their coffee beans are sourced from Cordillera Highlands tribes—named after some of the most beautiful Tagalog words. There’s Lipi, which includes coffee from Kalinga, Sagada, and Benguet; and Halimuon, a range featuring customized flavors like Peppermint, Dulce De Leche , and Cafe Mocha. If Coffee Project’s caffeine creations aren’t enough to lure you to visit, its feed-worthy ceilings designed to mimic a garden definitely will. 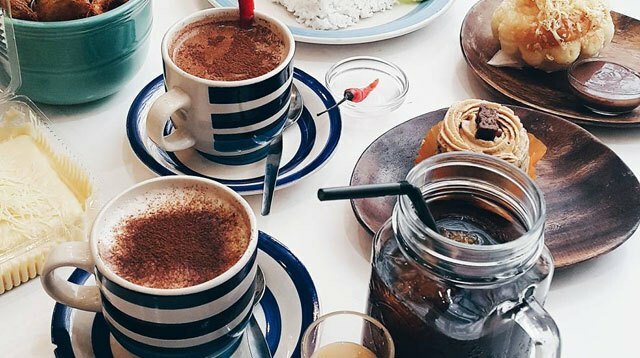 This cafe inside Wil Tower Mall has cheerful interiors that makes it perfect for brunch with your folks, date night with bae, or a simple catch up with your BFF. Order their Vietnamese Latte, a wonderful mix of creamy and sweet, or keep it straightforward with Ca Phe Sua Da, an iced coffee concoction served in a French dip filter with a pinch of condensed milk.